We love walking dogs around the DC area. There’s so much for your pup to see and smell in the neighborhoods. While we would never take your dog to a dog park without your permission, we do like to get to know them just in case. 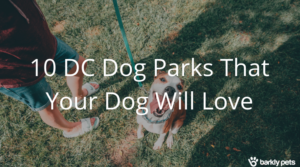 We checked out all the best that DC dog parks have to offer and we’re ready to tell you all about them. Before you head out, read our tips for a great day at the dog park. This gravel-lined dog park is fenced in and includes isolated areas for big and small dogs. There are poop bags available to help you clean up after your little guy or gal and plenty of trash cans as well. There is also a water fountain for when your pup runs too much and needs a drink. Hang out on one of the benches while your dog makes new friends! This is a brand new park for the dogs of NOMA and surrounding areas! This unusual name was voted on by the community. There’s plenty of space for dogs to run and play. Unlike many other dog parks in DC Swampoodle park is all turf and has some fun obstacles for dogs to play on. This park is beautiful and clean, with areas for kids and adults as well. We’re sure this park will prove itself as one of the great DC dog parks. Sundae would rather stay please. If your dog loves to run, they’ll love this turf-lined dog park. The AstroTurf won’t get your dog muddy or dusty so it’s a great park to come to if it’s raining outside but you still want to socialize. The Bundy Dog Park in the Shaw neighborhood is one of the longest in DC. It’s the perfect place to play fetch or for those dogs who have lots of energy to burn. There are poop bags available for easy cleanup but there’s no water fountain, so make sure you bring your own water! Also keep in mind that it’s one open area as opposed to separate enclosures for different sizes of dogs. This gravel-lined park is spacious and fun for dogs of all sizes. With separate enclosures, the big and the little guys have their own areas to play in. There’s even a tent for the smaller dog area when it gets hot in the summer. A water fountain and poop bags are also available for the dogs to utilize. This is another great AstroTurf option for a less messy dog park experience. This park even offers wading pools for the dogs in the summer time! There are plenty of poop bags to help keep the park clean. The S. St Dog Park can get quite busy during early evening hours, but is well worth the fun. Similar to Bundy Dog Park, this park does not have separate play areas so keep a mindful eye on the little ones. You can grab a seat on one of their many benches with your pup plays. This gravel-lined dog park has all the typical amenities including poop bags, trash cans, and benches. There’s also a water fountain and shaded areas within the enclosure for hot doggos to cool off under. This park includes separate areas for big and small dogs as well to keep play fun and safe. This dog park has plenty of grass for your best friend to run and play in. There’s water to share with the pups as well as trees to provide some shade when it’s hot. It’s spacious so there’s room to run and exercise. This gravel-lined park has a large and small dog enclosure for safe play. There is a water fountain, but it isn’t on year-round so be sure to bring your own water just in case. This park tends to flood and get muddy when it rains so keep an eye on the weather. It’s a popular one of the DC dog parks so come ready to make a friend. Shirlington dog park is by far the biggest in the entire DC metro area and easily spans the length of several football fields. If you have a puppy, Shirlington Dog Park is a great place to bring them! There’s a puppy-specific enclosure where they can learn to socialize with other puppies. There is, of course, a grown-up dog area too with plenty of poop bags and trash cans to keep it clean. If your dog is a swimmer, than Shirlington dog park is a must visit with a stream for water-loving dogs to play in, just keep an eye on them. Knowing dogs will get wet and dirty at Shirlington, the park even as an adjacent and very convenient self-wash station. It doesn’t hurt that there is a dog friendly brewery right next door as well! This dirt-lined park is spacious but does not have separate enclosures for big and small dogs so keep that in mind. Make sure to bring your own water, too, as there is none at the park. Otherwise, it’s a great place to let your dog play freely with a lot of space. Looking for a dog park in New York, DC or Philly? We’ve got you covered there too.